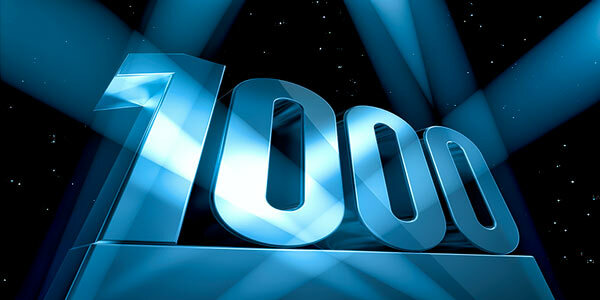 We are fast approaching our 1,000th download on The QuizMaker site. It’s such a milestone we are going to give away 10 free Quizzes to the person who makes that download. You don’t have to be a member* of the site and you don’t even have to buy a Quiz to win the 10 free Quizzes prize (download the free Quiz here). You just have to be the one who completes download number 1,000. When writing this post the number of downloads stood at 978 but this includes test downloads by us to check functionality. We want the 1,000th customer download to win this prize so the counter on the home page has been reset. What the counter reads now on the home page is the correct figure. If a single user keeps downloading the free quiz that wouldn’t be fair so we will not count multiple downloads. The lucky winner will receive a discount code for £60 to use against the Quiz downloads of their choice. And, as they say in all good competitions… this discount code cannot be exchanged for cash! The winner will be notified by email and we will add to this post once the 1,000th Quiz has been downloaded. *If you are member, all your Quiz downloads are recorded in your user area so you can re-download again at any time. So if you are planning to use The QuizMaker again it makes sense to be a member. UPDATE: Our 1,000th download was made at 12:29 on Wednesday 14th June 2017. The winner has been informed, more news coming soon.